The sweet potato and other vegetables are optimists. They send their ‘off-spring’ out into the world with a dream of next year in the garden. 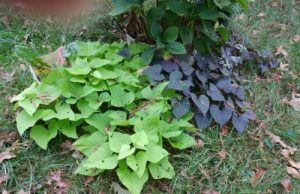 In the fall of 2016, there were two nice sized tubers for decorative sweet potato in the hanging boxes where I had been coddling the parent vines. I was intrigued that the chartreuse vine produced big turnip-colored (purple) tuber. The dark ‘black’ vine had only drab brown ‘taters’. Each sweet potato began setting ‘eyes’ in late spring 2017. VERY late spring; we didn’t get some of the cuttings into dirt until August! I just wanted some decorative vines and hopefully scrawny tubers for next year. In an old, abandoned, garden forum, I found the secret to getting good slips from the tubers. August had to be my stopping point to get them in the pots. Some of the last plants were still small when killing frost forced me to bring them into the basement shelter. One little red/purple vine ‘birthed’ a tiny white sweet potato! I can see a new tuber on the chartreuse plants, while the ‘old’ tuber seems to be in pretty good shape, producing a long and lush vine across the grass. They are sweet-natured plants, asking very little and getting very little dirt or water, but lots of light and protection. I did pull some of the tubers from the edible vines. They aren’t very impressive, but my focus is some slips for next season. The one little ‘potato’ from the red/purple vine in the hanging box is the only one out in the air. The other pots will be kept in the basement as long as possible, being coddled, watered and watched closely. Some of the pretty vine tips were tucked, with their exploratory roots, into a fresh pot of soil. They recovered and are thriving in the semi-darkness and shorter days of the basement. They are doing better than the older potted vines. The chartreuse clipping took a few days to get settled. I thought it might not be successful. Taking it in out of the weather into subdued lighting seemed to be the right treatment. I have 2-3 clipping plants taking root which will go into dirt and be ready for summer days in 2018. And we will have the ones in dirt to bring in. I want to think about putting some fluorescent lites. This ‘grow light BULB’ intrigues me.